Juni or Bug as we sometimes call her came to us from a shelter in Austin. She was a "scarel", meaning she wasn't a wild feral cat, just a scared cat. Because of her fear, she was deemed unadoptable. She's still shy and prefers to hide when you walk into the room. But if you're lucky, she just might allow you to pet her head ever so gently. 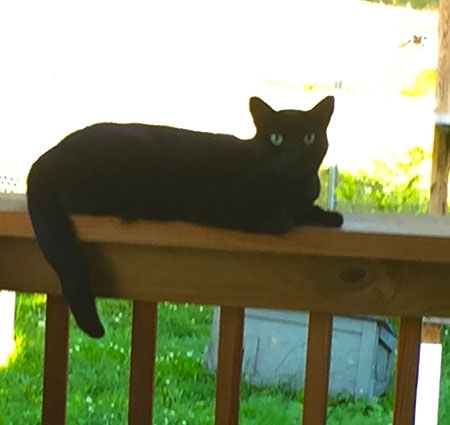 She's got a beautifully sleek coat and sports a little kink in her tail that we find so endearing. You'll often find her absorbing the warm rays in a window and watching the birds. 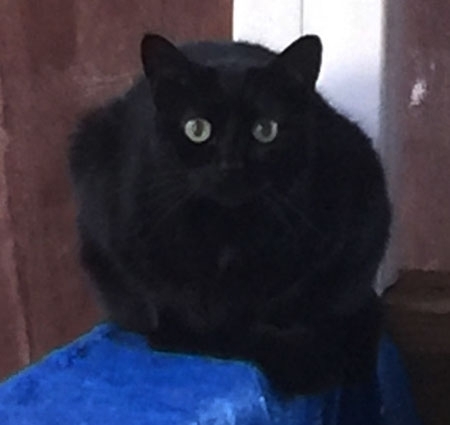 I chose to sponsor June Bug because I have a special place in my heart for black kitties & my family would always call me their "June Bug" growing up so it was a no brainer! Thank you for being such an amazing person & taking care of these precious babies! Tons of love from Oklahoma! Want to be another Sponsor for June Bug? Our kitties can certainly use more than one Sponsor. Click here to become another Sponsor.